A growing trend in the book industry is for publishers to ask authors to create their own promotional videos. The publishers then upload these videos to websites such as YouTube, as well as show them to book buyers at conferences and to media producers in hopes of securing TV time for their authors. In case you are asked to create such a video, don’t worry. I can help. Below are ten steps that I learned through formal media training and from my own TV appearances. 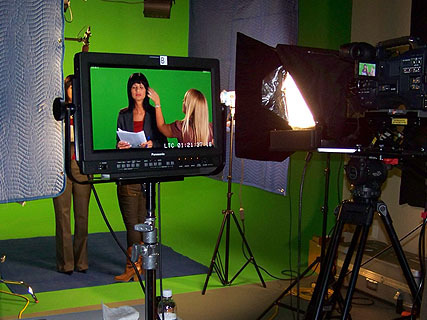 These tips can save you thousands of dollars in formal media training costs, not to mention greatly increase your chance of landing promotional TV spots. First, read the enumerated suggestions below, then follow the link to my last book trailer, and see if you can spot what I did right, and, perhaps, what I did wrong. Trailer For Dr. Rita’s Book: Radical Well-being, A Biblical Guide to Overcoming Pain, Illness, and Addictions (January, 2013, Charisma House). 1. Create Good Content: Your content should be persuasive, entertaining, and/or helpful. For non-fiction, establish your professional credibility by stating your qualifications when you first introduce yourself. Discuss your book’s focus, and establish how your book can solve the viewer’s problem. However, if you write fiction, it’s probably more important for you to entertain the viewers. “Hook” them with your captivating story line, and tell them just enough to make them want to hear more. Consider re-stating your name and the name of your book for emphasis at the close of your trailer. 2. Take Care in Your Delivery: Make an effort to speak slowly and deliberately, and don’t forget to enunciate. To do so, have a succinct, goal-oriented script with only one or two main points. Also, stay within the time frame requested by your publisher. 3. Choose Your Attire Carefully: Pick a solid color that doesn’t distract. Avoid red, black, white, and bold prints. Avoid large jewelry. When in doubt, go with simple and understated clothing and accessories. Men: unless you have six-pack abs, button your jacket, or you’ll look sloppy. 4. Watch Your Posture and Body Language: Sit up tall and straight, preferably at the edge of your seat, and lean slightly into the camera. Avoid direct head-on shots. It’s better to sit with your body angled slightly as you face the camera. Avoid exaggerated movements, as they can distract from your message. 5. Make It Personal: If you wish to make an emotional connection with your viewers, write a monologue about your book, and deliver it directly to the camera. Doing so gives each individual viewer the impression that you are having a private conversation with only him or her. 6. Be Happy, Relax, and Have Fun: Your positive energy will make you more attractive, and it will entice viewers to want to hear more of what you say. Also, try to relax. When you feel relaxed, you look relaxed, and your gestures appear more natural. 7. Smile More Than Usual: Video is a very cold communication medium. Facial expressions that look “neutral” in person cause you to appear cold and distant on camera. Smile the entire time you’re talking. 8. Wear Make-up: You can forgo the lipstick and eye shadow if you’re male, but don’t forget the oil-absorbing powder. Apply a generous amount to your forehead, chin, and especially the tip of your nose. The camera lights make you look greasy and pale, otherwise. 9. Hire a Professional Camera Operator: Subtle factors like choice of background, lighting, and camera angle strongly impact the image and feel of your video. Nonetheless, you could shoot a homemade video, first, for practice, and then get feedback from your agent or other professionals regarding your content, delivery, attire, and background before you hire the professional camera person at $100 per hour. 10. Once You Land a TV Spot: It’s more likely that you will be interviewed by a show host if you are asked to be on TV. In that case, keep your eyes fixed on the interviewer the whole time. Do NOT look directly at the camera as you might in a monologue. TV viewers want to feel like they’re eavesdropping on the private conversation between you and your interviewer. Make sure you’re the first one in position (sitting up tall, smiling, looking at the interviewer) when the cameraman starts counting down, and make sure you’re the last one still in position when the video shoot is over. Doing these subtle things helps build your reputation as a good TV show guest, and it might also earn you a return invitation to talk about your next book. Do you have any suggestions for TV appearances? Any questions about something I did not address above? This entry was posted in Marketing and Promotion and tagged book trailer, Christian book marketing, Dr. Rita Hancock, media training, producing a book trailer, recording a book trailer, Rita Hancock MD, shooting a book trailer, taping a book trailer, video trailers, videotaping a book trailer by Doctor Rita. Bookmark the permalink. Dr. Rita Hancock is a board-certified Physical Medicine & Rehabilitation doctor with a sub-specialty board certification in Pain Medicine. She is also a Christian physician, and serves as the Oklahoma state representative in the House of Representatives of the Christian Medical And Dental Association. Dr. Rita writes about health and wellness issues as they relate to her faith. Her books include The Eden Diet (Zondervan, 2008) and Radical Well-being (Siloam, 2013), which helps you overcome stress-induced illnesses, such as fibromyalgia, headaches, neck and back pain, TMJ dysfunction, IBS, and other illnesses that are aggravated by stress. For more information about Dr. Rita's diet books and relaxation CDs, visit www.TheEdenDiet.com or www.RadicalWell-being.com. Thanks for the great tips, Doctor Rita! What a valuable and timely post. I was just interviewed on video last week about my novel, and the camera man was kind enough to suggest I learn how to not say, “um” so much. (I swore up and down I didn’t say it once, lol!) I did, however, tell him I switched from nonfiction to fiction so I don’t HAVE to do video interviews. (Yeah, right!) I have SO much to learn, don’t I? Thank goodness you posted these tips! Rita–thanks for all this helpful info! I’ve done some TV and some of my own videos, but I’ll be better prepared for when my next books comes out. Will definitely do a trailer–and will keep this post for a quick prep. Thanks so much! Prior to each television appearance, I submit “potential interview questions” to the producer to “steer” the conversation. Seldom does the person I interview with have a chance to read my book beforehand. Typically they pour over this list just before the cameras roll and really appreciate the teamwork. Smile, relax, have fun. Remember – the interviewer is your friend! Really appreciate this post, Rita. Can’t wait to use it! Thanks for the list, Rita. Anything visual can be tough on us writers, and your pointers are excellent. Your own promo is very attractive and engaging with your examples and upbeat presentation. Bravo! Thanks guys. I like the additional tips. Yes…avoid the filler words, like “um” and “you know” and such. And by all means help the interviewer ask you the right questions by submitting potential interview questions. I do this all the time with radio producers. I even submit my answers to them in written form. Believe it or not, it helps them anticipate good segues.